Everyday objects such as posters, bus shelters, tables, trees or pavements can now be turned into musical instruments using a microphone that listens for the sounds that are created when you touch these objects. For example, it might listen for clapping, slapping, tapping, knocking, typing, wiping, etc and these are then translated into musical notes and tones. 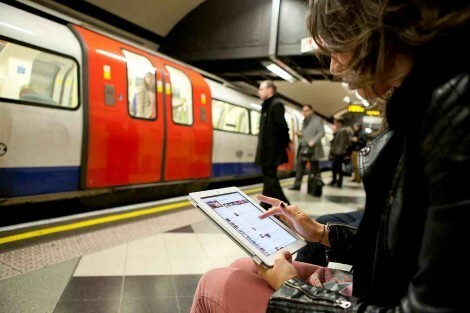 From June 2012 Virgin Media will provide free WiFi access to all commuters within ticket halls, escalators and platforms across 80 London Underground stations, with the service expanding to 150 stations within 18 months. After the Olympics this service will only remain free for Virgin Media customers. This will mean that OOH consumers will have more ways of searching for, and connecting to, online content via Underground OOH advertising then ever before. It will also allow for exciting interactive platforms and opportunities to drive response. With a dwell time of 3 minutes cross track 48-sheets offer a perfect opportunity for Augmented Reality experiences; 6-sheets can be NFC enabled and escalator panels can drive immediate branded search. A poster that changes tune when you throw something at it. 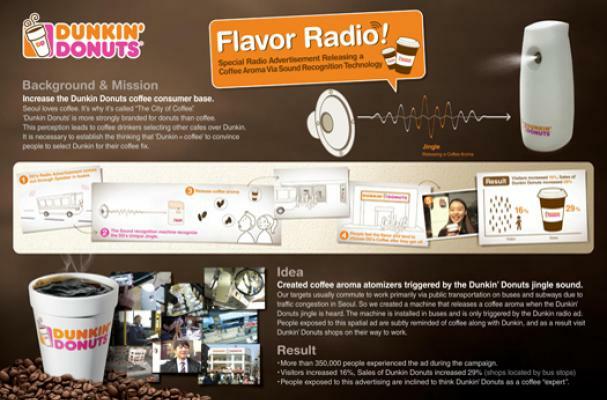 In South Korea audio-sensitive scent emitters have been installed on buses so that when the sonic logo for Dunkin’ Donuts is heard on the radio or in public, the smell of coffee is sprayed into the bus. It may be possible to extend this idea and create voice-activated installations that listen for particular words e.g. thirsty, coffee, lunch, or tea. To launch the FCell, Mercedes Benz’ Hydrogen cell fuel engine, they created an ‘Invisible Car’. By connecting a camera on one side which transmitted images to the opposite side which was covered in LEDs they were able to make the car blend in with the environment. This technique was actually invented about 10 years ago by projecting onto objects but until now has never been applied within a marketing campaign. A 3D projection mapping specialist has developed an interactive building display that allows audiences to have a live conversation with a digital character who has lifelike mannerisms due to the use of motion capture technology to mimic humans. We’ve seen buildings, vehicles, custom cut-outs, mannequins’ and globes being used as 3D mapping projection surfaces and this latest version projects onto real people.